In researching my own book on the New York music scene(s) and the neighborhoods from which they sprung, this observation seemed more interesting when applied to the kids, many of them Jewish, who moved in to the Lower East Side in the late 50s and early 60s on their way to making it the East Village of beatnik and punk rock fame. They were attracted by cheap rents; the rents were cheap precisely because their parents’s generation had finally clawed their way out of the neighborhood en masse. (The population of Jews on the Lower East Side dropped from half a million to just 20,000 in fifty years.) At least nowadays, moving to Lower East Side may carry some cachet of success; back then, the parents were literally flabberghasted by their kids’ decisions. 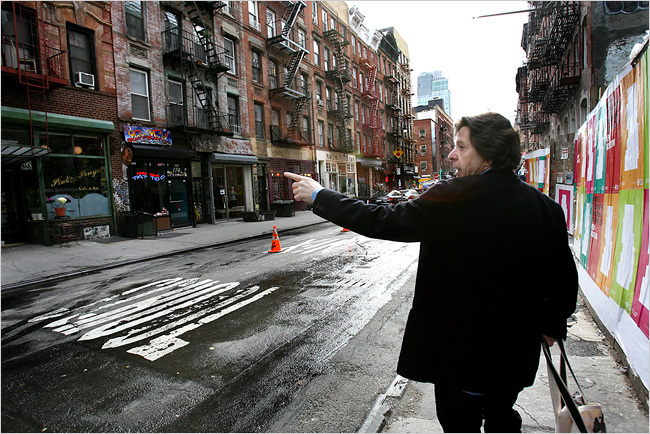 Richard Price on Ludlow Street. When the 1900 census reported the density of the neighborhood at over 450,000 per square mile, the figure surpassed even Bombay to make it the most densely populated corner of the world. Thanks, Richard. That helps. And, comforted by those words, I’ll now get back to my own book. Though the 1900 census figures are often quoted, there weren’t actually 450 000 people living in a square mile. It referred to the peak density of the worst couple of blocks. Not that their neighbours were living in luxury of course. Escapees from Berlin and Prague must have been astounded at the conditions. When’s the book out BTW? Longevity is such a magnificently optimistic typo that I will leave it there with your comment well noted. A note on the census figures. You’re not quite on it, though I know where you’re coming from. A couple of books went back to the LIbrary or I could throw more statistics at you than you would have stomach for. I do have this for you though: the 450,000 per square refers specifically to the Tenth Ward of Manhattan: “bordered by Division, Norfolk, Stanton Streets and the Bowery.” (Get out your mapquest.) Considerably more than a couple of blocks. The Sixth Ward of the old Five Points was not much better off. One other figure I found amazing: the Lower East Side Tenement Museum has estimated that some 10,000 people lived in that one tenement building during its 60-year period as a rental. And also to keep it in perspective, there were a solid half-million Jews living on the Lower East Side alone; these days, there’s not much more than a million living in the whole of Manhattan. Incredible. I remember seeing a table comparing the population densities of particularly notorious late nineteenth century slums and the LES came out on top as twice as cramped as anywhere in Europe The figures for the Prague ghetto were seriously distorted by the fact that the multi-level cemetery takes up about twenty per cent of the total area though. I’m already looking forward to buying the tome.